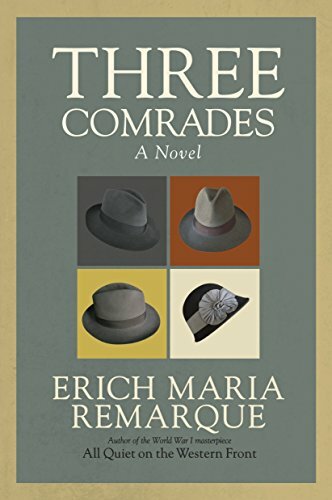 From the acclaimed author of All Quiet on the Western Front comes Three Comrades, a harrowing novel that follows a group of friends as they cope with upheaval in Germany between World Wars I and II. The year is 1928. On the outskirts of a large German city, three young men are earning a thin and precarious living. Fully armed young storm troopers swagger in the streets. Restlessness, poverty, and violence are everywhere. For these three, friendship is the only refuge from the chaos around them. Then the youngest of them falls in love, and brings into the group a young woman who will become a comrade as well, as they are all tested in ways they can have never imagined. The year is 1928. On the outskirts of a large German city, three young men are earning a thin and precarious living. Fully armed young storm troopers swagger in the streets. Restlessness, poverty, and violence are everywhere. For these three, friendship is the only refuge from the chaos around them. Then the youngest of them falls in love, and brings into the group a young woman who will become a comrade as well, as they are all tested in ways they can never have imagined. . . .
Erich Maria Remarque, who was born in Germany, was drafted into the German army during World War I. Through the hazardous years following the war he worked at many occupations: schoolteacher, small-town drama critic, race-car driver, editor of a sports magazine. His first novel, All Quiet on the Western Front, was published in Germany in 1928. A brilliant success, selling more than a million copies, it was the first of many literary triumphs. When the Nazis came to power, Remarque left Germany for Switzerland. He rejected all attempts to persuade him to return, and as a result he lost his German citizenship, his books were burned, and his films banned. He went to the United States in 1938 and became a citizen in 1947. He later lived in Switzerland with his second wife, the actress Paulette Goddard. He died in September 1970.